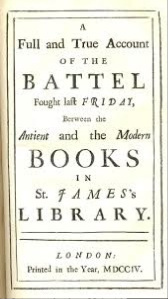 Do you remember Jonathan Swift’s account of “the terrible Fight that happened on Friday last between the Antient and Modern Books” in St. James’s Library? That was last Friday some month in 1697, but it could easily have been an account of the biblio-fisticuffs between Antients and Moderns any day on the Web in the last twenty years or so. What is our role as 21st Century Librarians in this future of “reading“? Or, is being a librarian only about ACCESS? Has the librarian finally devolved into an information advisor, as well as an insurance salesperson? According to LJ, Hartford Public Library Nation’s First to Be Certified by Bureau of Immigrant Appeals, Hartford (CT) Public Library staff are now immigration advisors – not just immigration information specialists, but advisors. The Hartford Public Library (HPL) is just across the street from the United States Citizenship and Immigration services office, making HPL a common destination for immigrants who need computer access to bring up information and fill out online forms—access they often don’t have at home. To ensure that HPL staff can serve the needs of this community, HPL has become the first public library in America to have staff members accredited by the Bureau of Immigrant Appeals (BIA), so they can assist immigrants with the often confusing paperwork and online forms they need to fill out to get on – and stay on – the path to permanent U.S. citizenship. Is this the future of librarianship in America? Are public libraries becoming an extension of the federal government? If West Yellowstone community needs more forest rangers for all the area parks and camp grounds, should the library have its employees qualified as rangers to help out? So, if the community needs more DMV offices because the waiting lines are so horrifically long and the service is legendarily bad, a library should step up and start a motor vehicle registration service? If a community needs more health care professionals, the library should train its staff to provide health care services – like becoming “Champions for Coverage” for the new Affordable Care Act? Oh wait, those librarians aren’t health care professionals, they’re insurance salespeople. The most egregious part of this situation is explained in this paragraph. “Getting BIA accreditation for the staff provides the legal authority to do it and legitimizes the institution.” SERIOUSLY?!?! Now the library being legitimate depends on federal government certification, and librarians are not only allowed to offer immigration assistance but immigration advice! Is that what librarianship has devolved into? Do librarians want the legal responsibility or liability of giving bad advice? The article goes on to elaborate on how appropriate it is for librarians to be counselors. Or even worse, giving them incorrect information, an all-too common pitfall in legal services for immigrants, said Pichardo. And since immigrants who get poor or incorrect advice can often find themselves deported, they have little recourse if they’re given poor advice, the bills for which can run into the thousands. It is totally shameful to play on librarians’ desire to help people by twisting the rationale for providing reference services into providing counseling advice. Where do librarians draw the line? What happened to the unbiased delivery of information? Is there no more distinction about what is “the core mission” of libraries? Once the norm for librarianship becomes giving “advice” to library users, will libraries be totally unrecognizable in the future? When you add to this non-mission personal service the implication in the report that the “community demand” for this service is from people who are not even residents of Hartford and don’t pay taxes in Hartford, one has to seriously question what influences prompted the library to actually pursue this “service” at no small cost to legitimate Hartford tax payers. If I was a Board member, I would certainly not have voted in favor of such a proposal for this library service, unless the incentives for Hartford and the library were extremely lucrative. Makes one wonder, doesn’t it? Somebody in this profession had better wake up and realize that the profession is becoming totally diluted from what librarianship was supposed to be – universal access to information – NOT counselor and advisor for personal services. ONLY THE LIMITS OF YOUR IMAGINATION ARE WHAT YOU CAN DO WITH THIS IN YOUR LIBRARY!